Been staring at that poppyseed salad for awhile, eh? My bad. Let’s change the scenery, shall we? It’s never not a good time for banana bread. Plus it happens to be a personal favorite of my Valentine, and I’m a sucker for that guy. 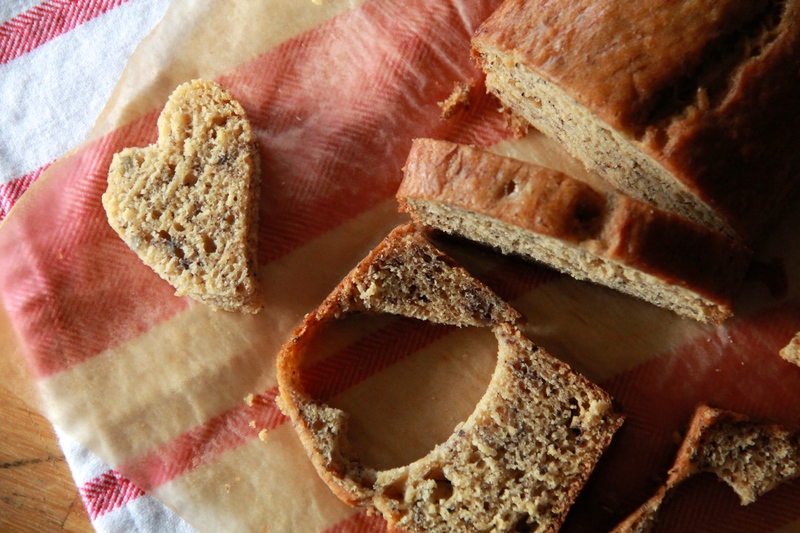 There are a million different ways to banana your bread, and I have yet to settle on “my” way. I think my way involves browned butter, but that’s as far as I’ve gotten. It’s certainly a good start, anyway. This time around, I turned to the lovely Zoe Francois of Zoe Bakes, whose blog I’ve been following for ages and whose recipes are always second to none. Her original recipe is for Nutella Swirled Banana Bread (um, HELLO), but since I can’t keep Nutella in my pantry without terrible things happening (read: flabby jowls) I left it out. 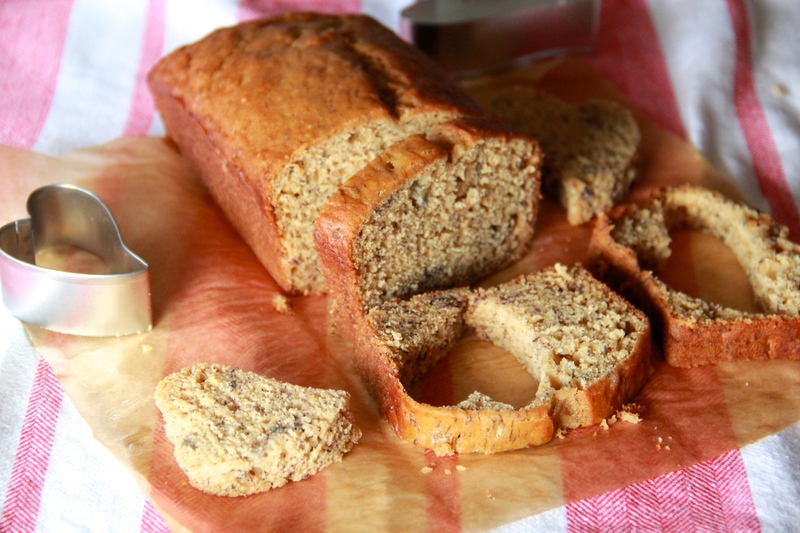 What’s left is a banana bread for purists – strongly banana, faintly sweet and lightly spiced. The recipe makes two loaves — one for now and one for… slightly after now. 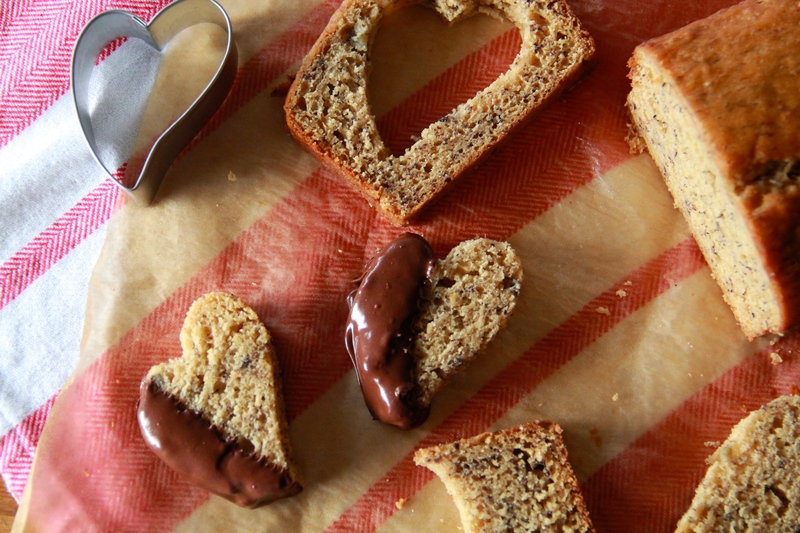 If you’re feeling cutesy, it’s pretty fun to cut out banana bread hearts, dip them in chocolate, and trade them for smooches. Heat oven to 350 degrees F. Grease two (8 1/2- by 4 1/2-inch) loaf pans, then line them with parchment paper. Grease the parchment, too. In a medium bowl, mash up the bananas with a fork or potato masher, until wet but slightly lumpy. Set aside. In a saucepan over medium heat, melt the butter, then continue cooking, swirling the pan occasionally, until the milk solids have turned an amber brown. Remove the browned butter from the heat, and pour it into a large bowl. Beat the browned butter and sugar until well-combined, then add the milk, eggs and vanilla and continue beating until smooth. In a separate bowl, whisk together the flour, baking powder, baking soda, salt and cinnamon. Add the dry ingredients to the wet, and mix just until smooth. Add the mashed bananas and mix just until combined. Divide the batter between the prepared loaf pans and bake until a skewer inserted into the middle of the bread comes out clean, about 45 minutes. Allow the loaves to cool before slicing them up and serving. 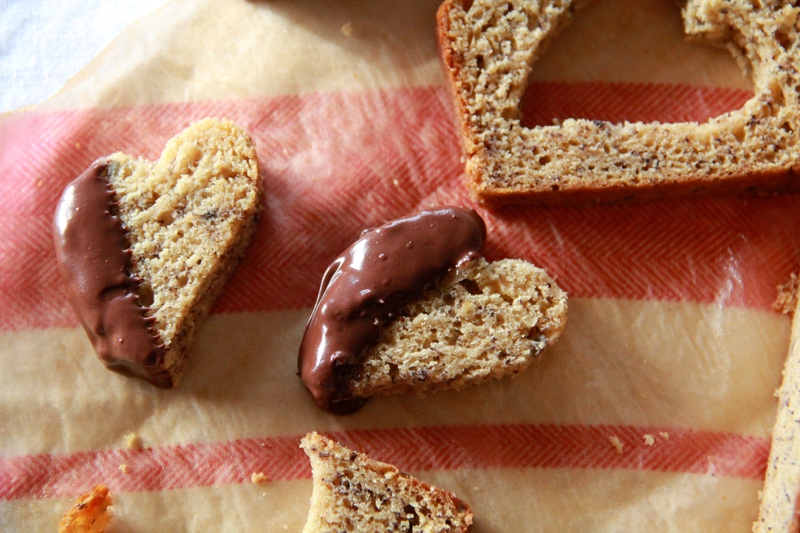 If you like, use a heart-shaped cutter to cut out little banana bread hearts, and partially dip them in melted chocolate. Lay the chocolate covered hearts on a piece of parchment paper, then place them in the refrigerator to set up. Love this idea! looks yummy! Goodbye poppy seeds. ( it is about time…) Like this banana bread! Wow – my new and ONLY banana bread recipe from here on out – it was DELICIOUS!! I topped mine with crumb topping before baking – yum! It makes the whole house smell good and it tastes incredible – thanks Shelley!